It is easy to think of how wasteful we are in terms of food, and paper objects, but what are some other types of materials that we waste?? 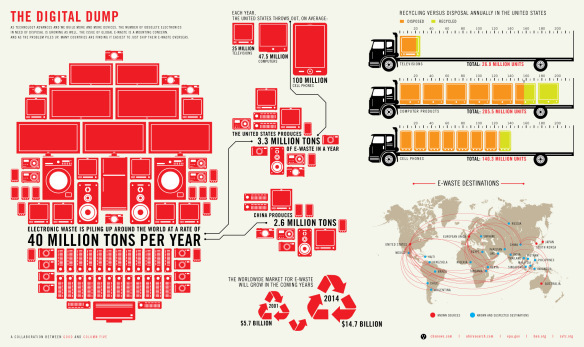 E-waste is a growing issue, and it needs to addressed for multiple reasons. E-waste is when electronics such as computers, and cell phones are thrown away instead of recycled. There are different kinds of materials and energy that are used to create these electronic devices and they need to be disposed of properly in order to continue to have access to these materials. Not only that, but why would you want to throw something away when you can easily recycle these materials? The biggest items that we are wasting are cell phones, computers and televisions. Sometimes these items are disposed of when there isn’t even anything wrong with them, we just want the newer, updated model. There’s nothing wrong with wanting the newest, best gadgets, but at what cost? Instead of throwing away these items you can actually find a company that recycles the materials for you in order to create new electronics. This doesn’t just benefit the company that is recycling, but ultimately this benefits us as a people. We love using these items and eventually we are going to run out of the materials that we need in order to create them. Let’s work together to help get our e-waste issue under control!